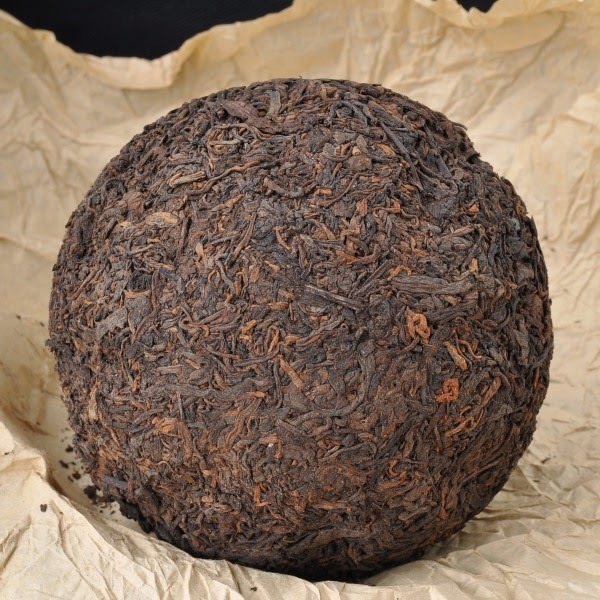 This Jingua, melon shaped shu puerh is from the late 1980s. 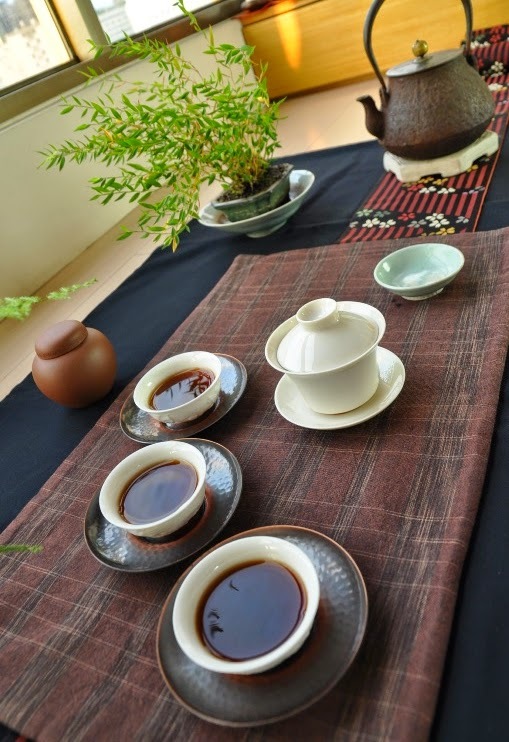 It was made at the Menghai Tea Factory. The weight should be 500 gr, but due to time, the melon now weighs approximately 450 gr. (The leaves become drier with time). It's possible to see that the shape isn't completely flat, but that there are melon marks on the tea. How do we confirm that it's really so old? First, we can look at the packaging. The color of the paper is yellowish and has a certain old feel that is consistent with a 20 to 30 years range. This wrapper has no inscriptions, logo or anything. Why? Up to the 1988, Taiwan had an embargo on things coming from China. 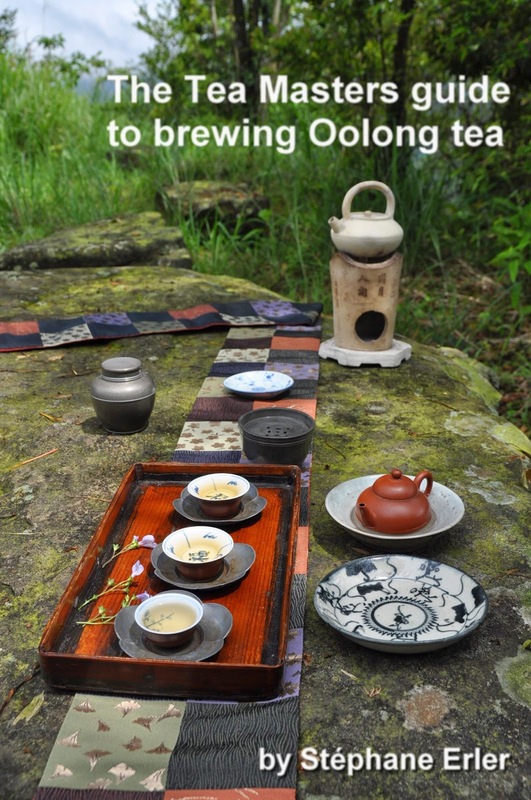 It was progressively lifted and puerh was slowly allowed (but Oolong still isn't). So, to import puerh in the 1980s, Taiwanese merchants would have the puerh repackaged with blank wrappers to get them through customs more easily. This wrapper therefore makes sense, but it makes confirming the identity of the tea more tricky. From the examination of this wrapper, we can also tell that the storage conditions (in Taiwan) were very clean and relatively dry: there are no brown tea stains on the paper. 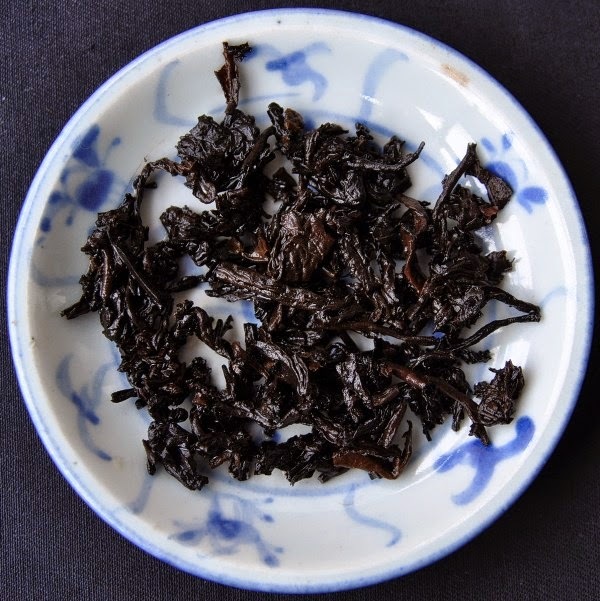 The leaves don't have this very black color of newly made cooked puerh. There are also signs of the tea getting progressively loosened at bottom of the melon. What's very important is to see that the color of the leaves on the surface and below the surface is very similar and looks very 'natural' and not moldy (like when we see white mold on the surface of the leaves). Here is how the leaves look like when they are flaked. 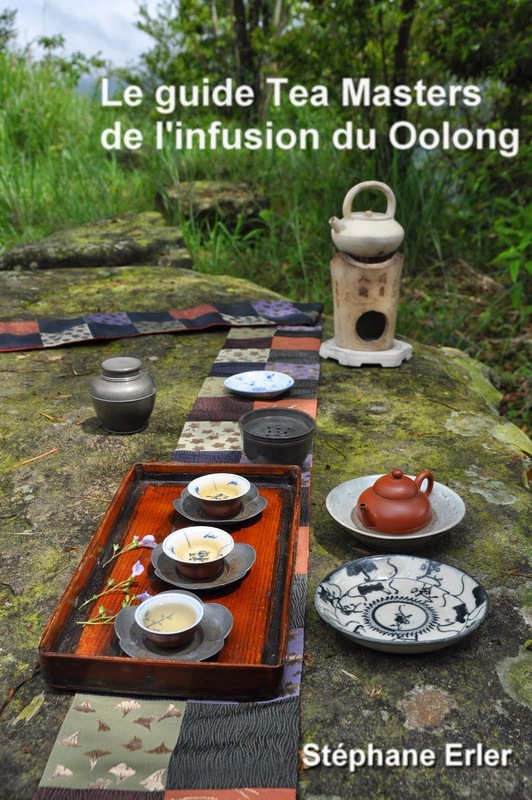 I measured 3 grams in order to make a proper tasting and testing of this tea with a white porcelain gaiwan. There are many buds and smaller leaves among those leaves. This is very fine material. 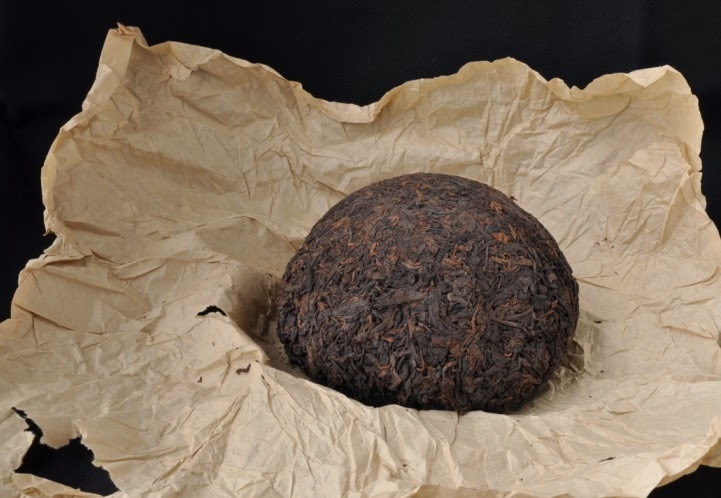 When seen like this, it's extremely difficult to tell what kind of puerh it is or how old it is! The only way is to taste it! So, here is what the first long brew looks like. Very dark, but very clear (no turbidity). The brew appears very rich and almost like jelly. A different angle shows a the dark brown color of the brew. Beautiful! You can read the detailed tasting and more pictures in the boutique. 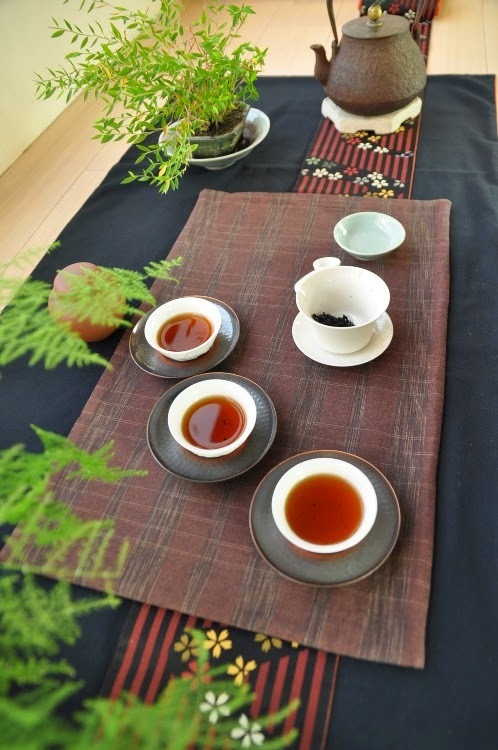 What's particularly remarkable is how clean, sweet and lively the taste and aftertaste are, despite the dark, concentrated color of the brew. 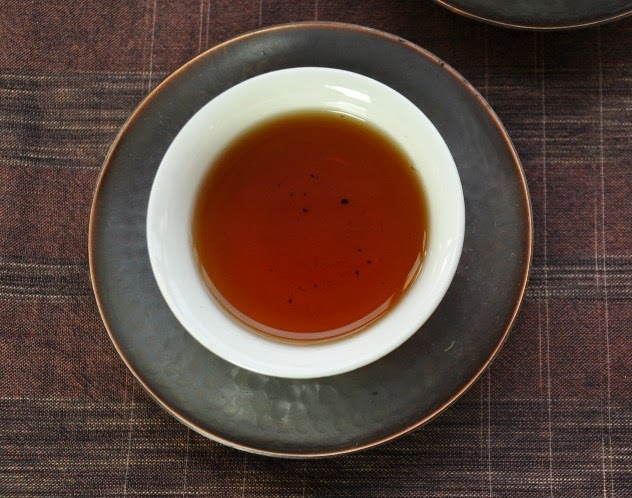 This particular sweetness is a characteristic of older Menghai shu puerh. 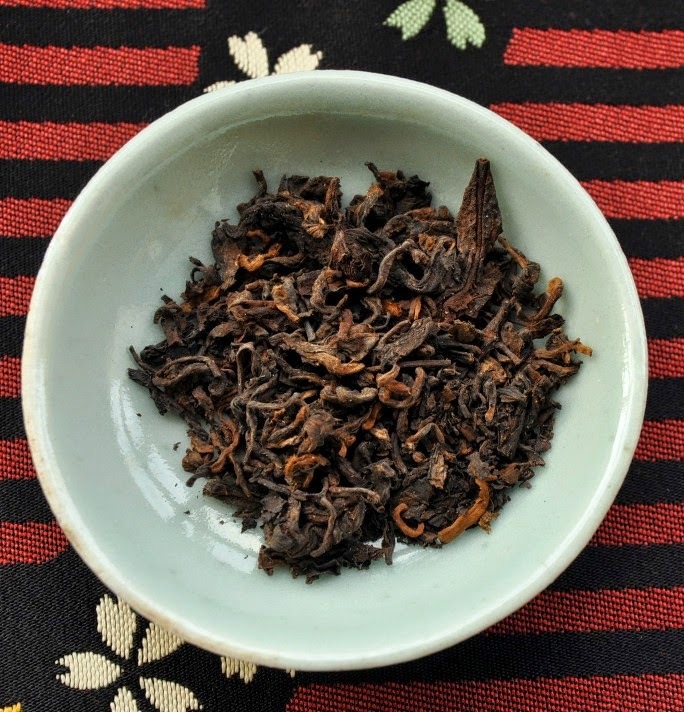 In the 1980s, the wodui process didn't produce overcooked leaves, but left a little bit of life in them (and at that time they would use better leaf material). This gives this tea a lot of similarities with much older sheng. Of course, it's still not the same, but it's also just a fraction of the price of the old masterpieces. And the overall feeling is very pleasant and warm, especially now as the weather turns cold. But I still feel a little bit cooling effect on the tongue, as it's not completely cooked. The open leaves are, as expected, very dark and black, but we can also see some dark brown color among them. 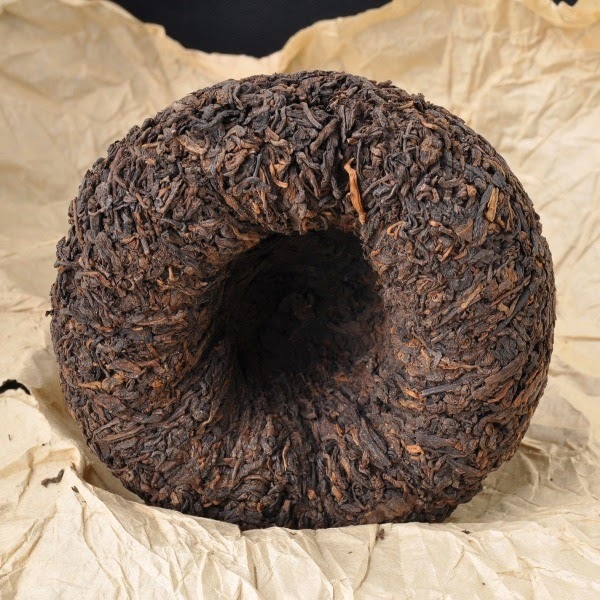 The search for this wonderful wodui puerh has taken several years. 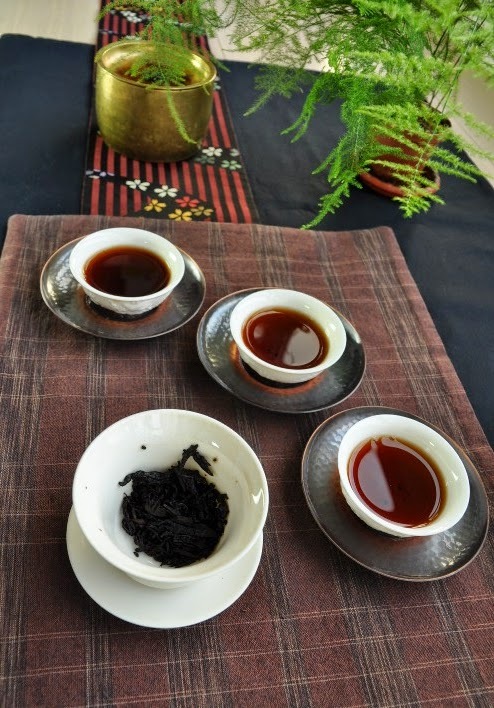 I don't even remember when I last presented a shu puerh on this blog and in my selection! It wasn't for lack of searching. 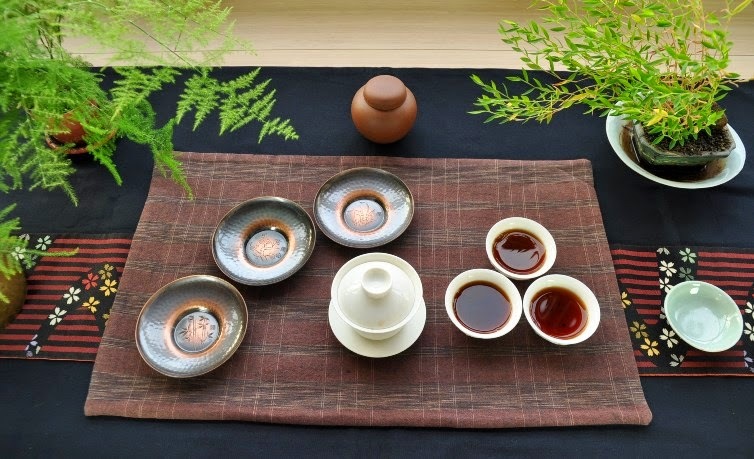 As recently as last month, I attended Taipei's latest tea fair and went to all the stands asking to taste their cooked puerh. But I couldn't find any that I liked and that could shoulder the comparison with my other puerhs. Now I have finally found one!